In today’s day and age, we are always on the move and constantly finding ourselves in the midst of chaos. Due to this, keeping track of our appointments and schedule can become a daunting task. Most people have faced the embarrassing situation of double booking themselves, or forgetting about an appointment, missing an important meeting and so on. To avoid such awkward situations, it is highly recommended that you maintain an appointment calendar. 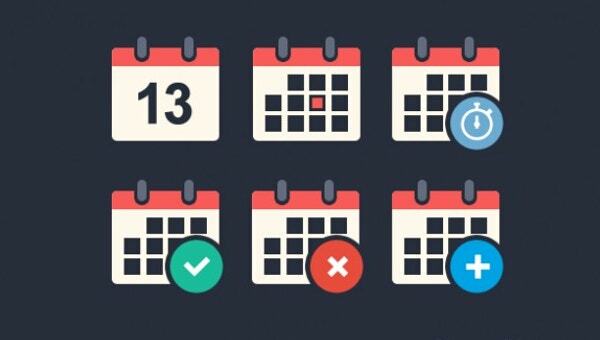 Here’s a range of our best appointment calendar templates for you that will help you keep your schedule on track. You can also see Event Calendar Templates. The month appointment calendar template download is absolutely free of cost. As the name suggests, it helps you keep track of your monthly appointments and meetings. 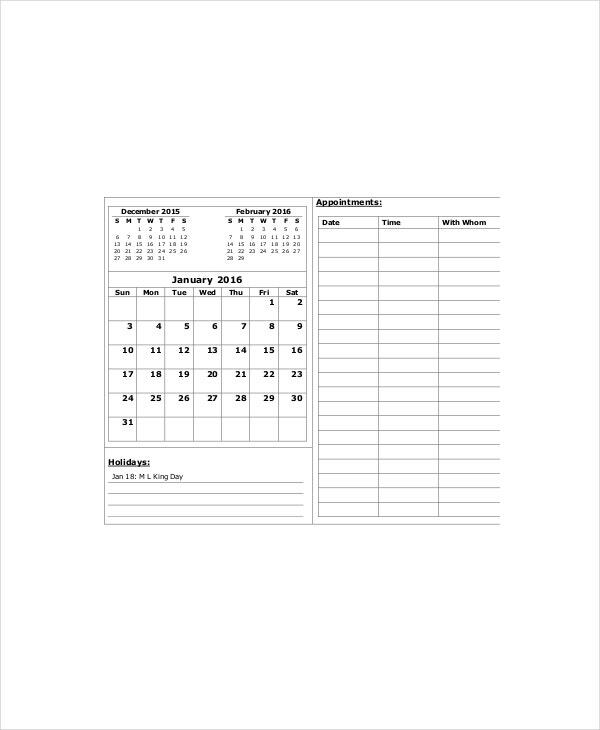 These Calendar Templates has columns for the date, time and details of whom you have the appointment with. The appointment calendar template 2016 has weekly, as well as daily templates to choose from. These appointment templates have columns for the time, day, date and so on. They are extremely useful to avoid double booking or missing appointments. The weekly appointment event calendar template is a simple, multi-column Excel based sheet. 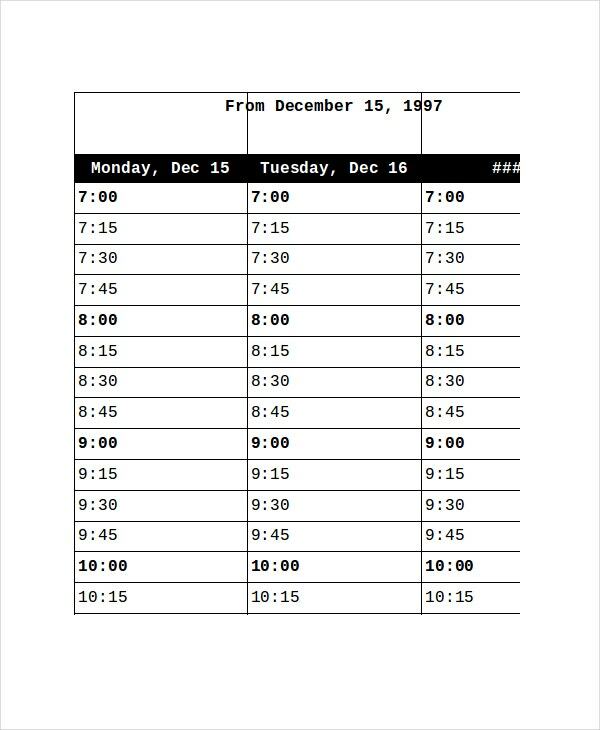 It has columns for each day of the week along with the date and time. These templates are ideal for keeping track of your schedule during those hectic and chaotic work weeks. You can also see Pocket Calendar Templates. The blank weekly, monthly appointment calendar template is completely editable and is also available in a wide range of layouts and formats. The blank templates are ideal for all types of professionals and even business people. 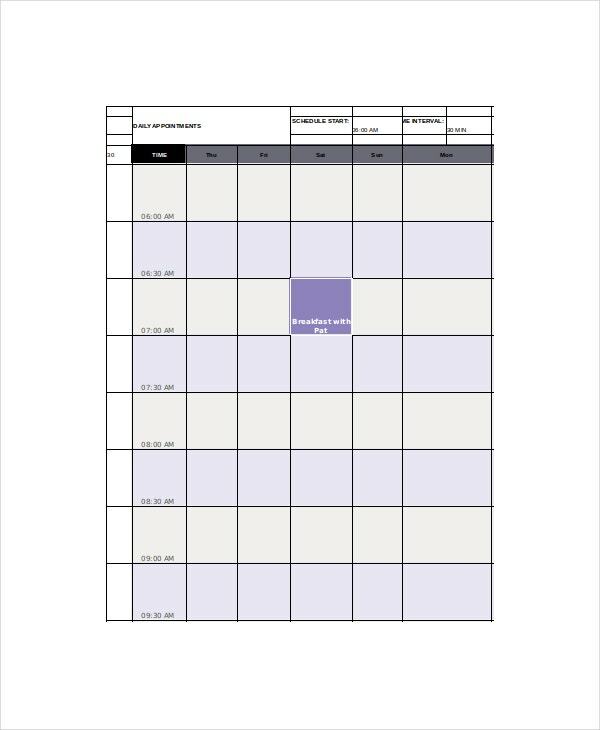 The printable daily appointment calendar template 2016 has a time column and columns to fill in the details of your appointments and meetings. It’s a simple Excel sheet that works wonders in helping you keep track of your day. > How do I create a new Appointment on my Calendar? The beauty of the appointment calendar templates is that they are easily editable. They can easily be edited in programs like Word and Excel. 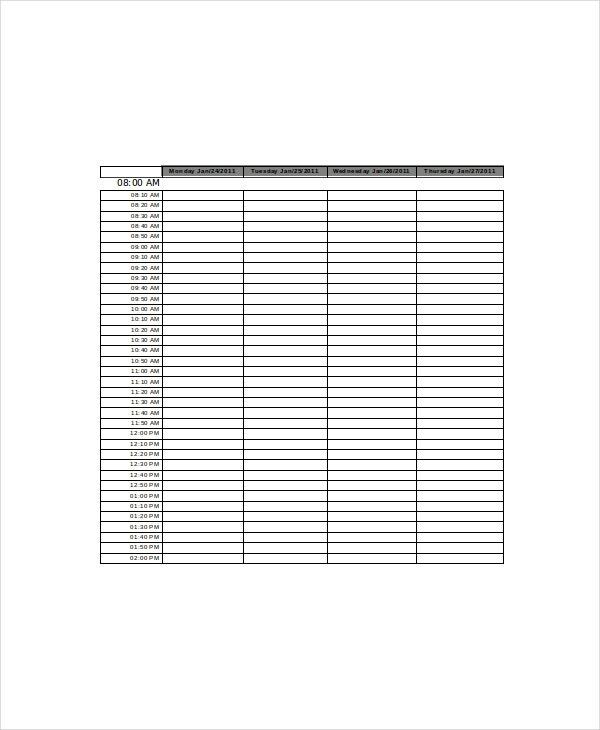 If you’re wondering how to create a new appointment on your free printable appointment calendar 2016, all you need to do is download the template, open it in Microsoft Excel or Numbers, edit the column that you wish to add your appointment or meeting in and save the changes. You can also see Desk Calendar Templates. Additional editing and changes can be made to the document as and when you require. The templates can also be further emailed for your convenience. They are accessible from most smartphones, computers, and tablets. 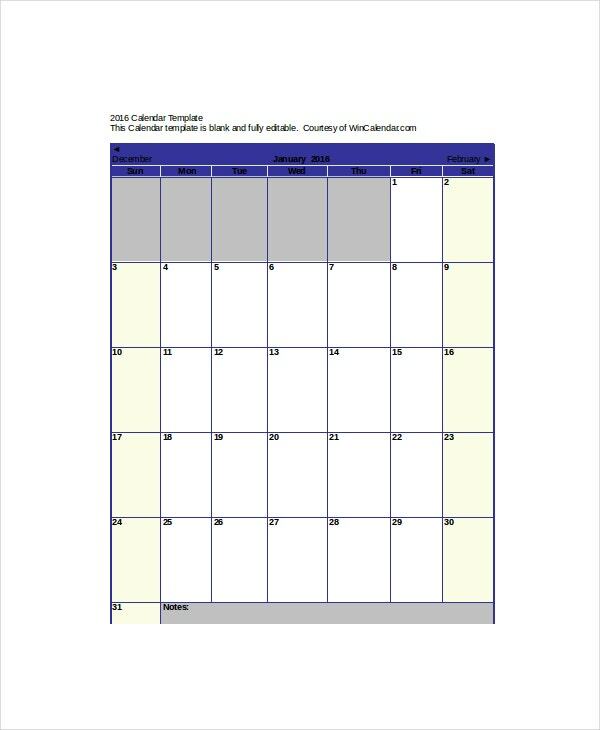 The calendar templates are extremely useful and can help you keep your schedule in order. Now, you no longer need to spend tons of money on hiring a secretary and assistant. These fantastic templates will do their job for you and the best past is that they are absolutely free of cost.